Watching The Wizard of Oz on TV a reminded me of a presentation I delivered some time ago using the Oz story as a metaphor for exploring lessons in leadership. My inspiration came from Lou Tice, a former championship high-school football coach in the state of Washington, who built The Pacific Institute by coaching managers in ways to introduce positive wizards and good mentors into their lives, while expelling negative wizards or those who to make you feel bad about yourself tell you that you are incapable of success. 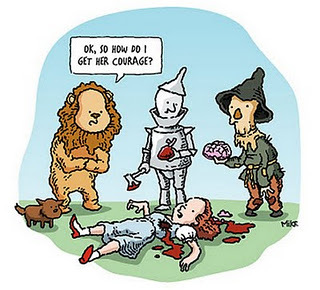 You see Dorothy did in fact become a great leader, because she took a guy with no brains, one with no heart and one with no courage” and developed them into an effective team that successfully accomplished its mission. The story begins with Toto the dog, Toto has unfortunately bitten Miss Gulch, a nasty neighbour and serial complainer, Miss Gulch has got a warrant for Toto from the sheriff and is demanding that Aunty Em and Uncle Henry hand Toto over or she will sue them for damages and take their farm. Dorothy had tried to communicate the problem, and it was dismissed as an over reaction, a storm in a teacup again! The adults had formed conclusions based on Dorothy’s previous patterns of behaviour in response to interactions with Miss Gulch, and since they are awfully busy they fail to pay attention and miss the important details. Dorothy is young; she is fraught with emotion and fully understands the implications of what has happened, we can understand how this has impacted her ability to communicate the problem in a calm and rational manner. Leadership Lesson: When did you last fail to really listen to the extent that you fully understood the meaning in a message? Communication is a two-way process; and when the speaker is weak, the listener must be especially strong! Dorothy and Toto show up at the home of the wizard, he notices that she looks weary and a little disheveled, he suspects she may have run away from home, rather than jump to conclusions he asks Dorothy to close her eyes while he consults his crystal ball. While Dorothy’s eyes are closed tightly he rummages in her bag searching for additional data to help him to accurately identify her needs. He finds a picture of Aunty Em, he gazes into his crystal ball and says “I see a picture of a woman who appears to be on a farm”, and Dorothy says “that must be Aunty Em”. The wizard explains that the woman looks sad because she is missing someone. Dorothy confirms that she has run away from home and is guided by the wizard who helps her form a plan to go back home. Leadership Lesson: A little research effort will produce evidence to ensure your efforts are focused upon the real problem, effective leaders ensure they gather objective data before jumping to conclusions! Life at the top can quite often feel a little like you are catapulting from one crisis to the next the equivalent of being caught up in series of tornado’s or twisters! Dorothy gets caught in a twister of epic proportions, rather than loose her head she keeps her eye on the storm evaluating its impact. Leadership Lesson: You too can be the eye in the middle of your storms, the person who remains cool in a crisis, no use loosing your head in a crisis because that would deny your observational skills the opportunity to gather data! The scarecrow thinks he has no brain, but in fact he is a highly reflective thinker and given a little time to think he produces amazing solutions to problems. There is a scene in the forest where Dorothy and the Scarecrow stop to pick some apples but the apple tree does not want to hand over the fruit so easily and puts up a fight. The scarecrow hatches a plan to annoy the tree and he taunts the tree until it becomes so angry it starts to throw apples at him, letting go of the very thing it desperately wanted to hold on to. Ultimately it is the scarecrow that puts together the plan to rescue Dorothy from the castle of the Wicked Witch. Leadership Lesson: Consider this, are you allowing your scarecrows time to reflect or condemning them because they appear to fail to make a contribution at meetings? When does slow thinking lead to richer solutions? Do your Tin Men need oiling? The Tin Man thinks he has no heart, he isn’t heartless as in cruel, he simply lacks the will or motivation he doesn’t have the heart to do things any more. The tin man’s focus on fear of failure has actually prevented him from doing anything at all. The Tin Man is the most caring character in the story; he cares and worries about everything until he sheds tears which cause him to rust. Leadership Lesson: Who are the Tin Men in your organisation? The people who consistently deliver, those who fly under the getting attention radar. How are you acknowledging their contribution, recognising their success, keeping them oiled? The wizard helped the scarecrow who thought he didn’t have a brain, the tin man who thought he didn’t have a heart, and the lion who had lost his courage to identify their abilities and visualize themselves in new ways. You’ll be surprised at how people respond to high expectations!